This Class 1000 (ISO 6) and Class 100 (ISO 5) clean room contains instruments for fabrication of microstructures. For sample cleaning, inspection and mounting. Also used for laser cavity assembly. 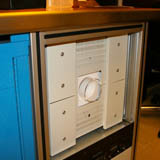 For drying samples without going through density changes. For measuring sheet resistance and volume resistivity. Used in photolithography. Aligns masks to existing structures on a wafer and exposes the photo-resist to transfer the mask design. General purpose instrument used extensively to characterize lithographically produced structures. Features: Bright field, dark field, differential interference contrasting, Mireau interferometer on 10X objective, Image capture on networked computer, 3-axis-automated stage with position readouts for metrology and patterning. Measures feature height and surface quality. For measuring step height and surface roughness. Used for depositing metal layers for lithography and optics. Used for dry etching and ashing. 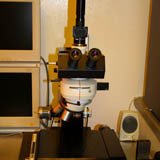 Performs electron microscopy. 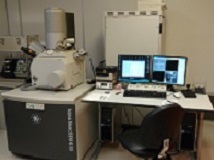 It can also be used to do electron beam lithography. For spin coating resist and other materials on substrates. Both spinners are located in the solvent bench. Used for magnetron sputter deposition. Used for oxide growth and diffusion. Flow control: Two mass flow meters, 5 liters/minute max. Used for connecting wires from chip to package. * Mention of commercial products is for information only; it does not imply NIST recommendation or endorsement, nor does it imply that the products mentioned are necessarily the best available for the purpose.